North Kerala (Malabar) got influenced by many Arabic dishes and Alsa / Aleesa is one of the main examples for such a dish. In Middle East it is calling as Harees (slight variation in method and ingredients) and is served mainly during Iftar time. Alsa is the most common recipe of north Kerala Muslims. It is served during marriage ceremony and special occasions, as a starter. Serving Biryani without Alsa is just like food without salt. Soak wheat overnight for best results. You can cook otherwise too, but will take lesser time if soaked. Boil water in a pressure cooker, add all the ingredients in first list to it and let it boil. Close the lid and after the first whistle, turn the flame to low and leave it to cook for about 1/2 an hour. (The time varies between soaked and unsoaked one. So take care of that). Check that after 20 minutes. Now when the wheat is done, switch off the flame and remove the chicken and whole spices from it. Remove the bones of the chicken and put the chicken back to the alsa. Now start whipping the alsa using a wooden spoon, a potato masher at times, a food processor or an egg beater too. But take care while using a blender or food processor. Just pulse it and don’t grind all the wheat. Also alsa should be cooled enough before using a blender. Now fry the onions, cashews and raisins in ghee for garnishing. Serve alsa garnished with these along with ghee and sugar. 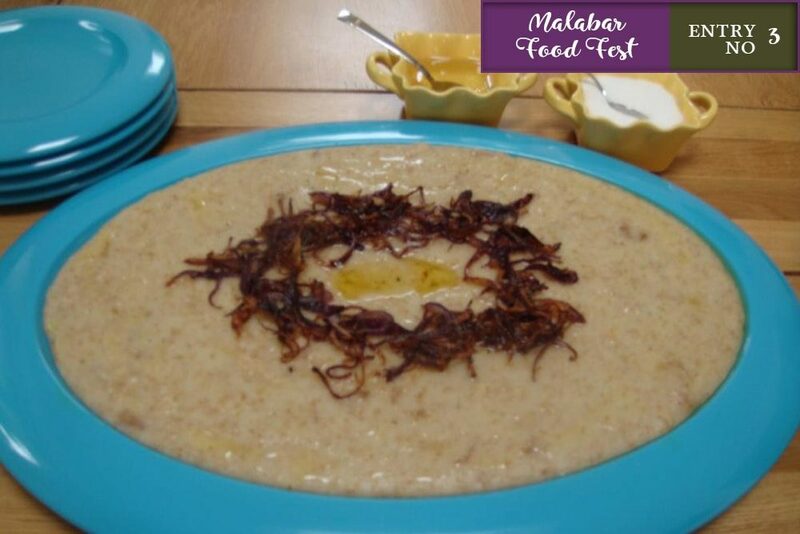 This recipe was submitted by Mrs. Kumari as her entry for our “Malabar food fest 2018” organized to collect and share the traditional recipes of Malabar. If you haven’t submitted your recipe yet, please visit our food fest page to win an amazon gift voucher of 2,000INR. If you have got any comments/suggestions/ feedback about this entry, please drop them below. You can also try more malabar recipes from our collection. This entry was added on April 12th, 2018 by Renoos in Non Veg and tagged with malabar food fest, sweet alisa, malabar recipes, chicken alisa, harees, malabar haleesa, how to make thalassery style aleesa, alsa, aleesa. Last revised on April 13th, 2018.